Committee member Dave Bishop has been preserving an archive of York Rally materials for over half a century, and he’s kindly made it available for the new Rally website. 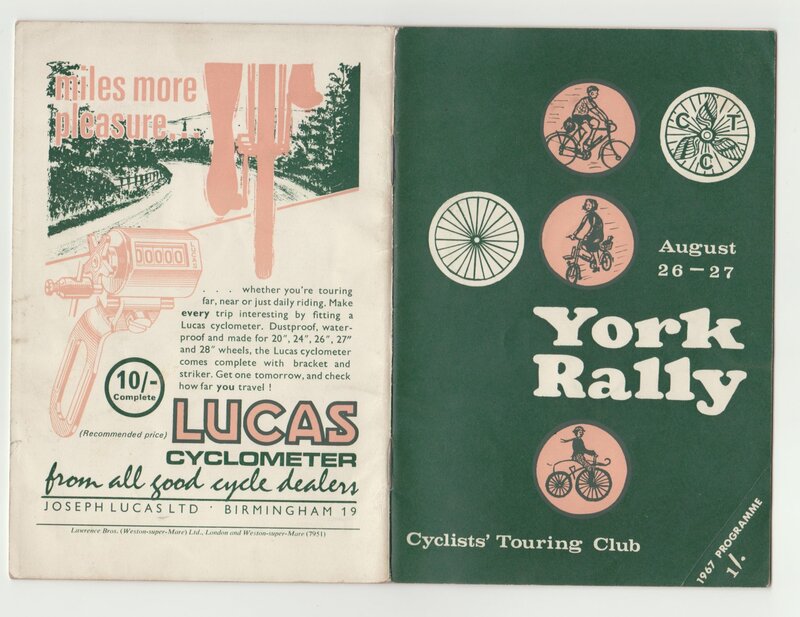 So I’ve made a start on the scanning, with a look back to the 1960s. 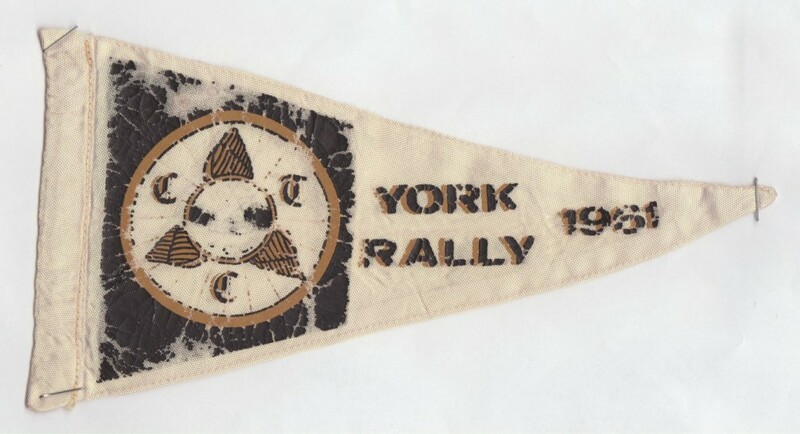 Click any image to enlarge – and I have the original scans at twice this resolution for the archives. 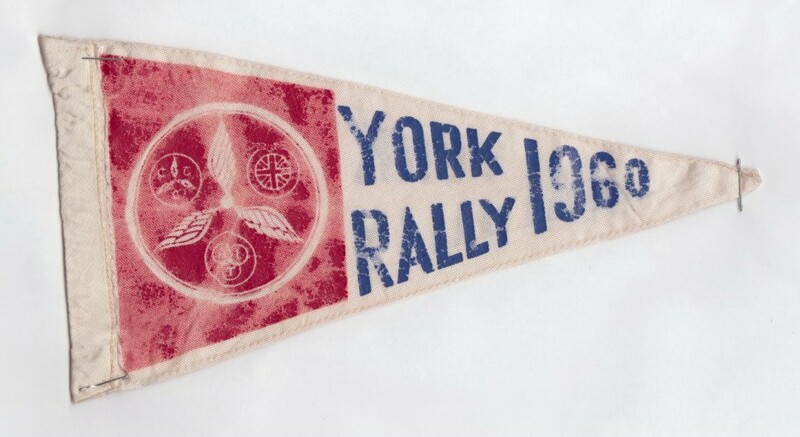 That’s all the pennants we have for this decade. Unfortunately, even after our previous article on the subject we still don’t know much about these Rally pennants. Who designed them? Where were they flown? 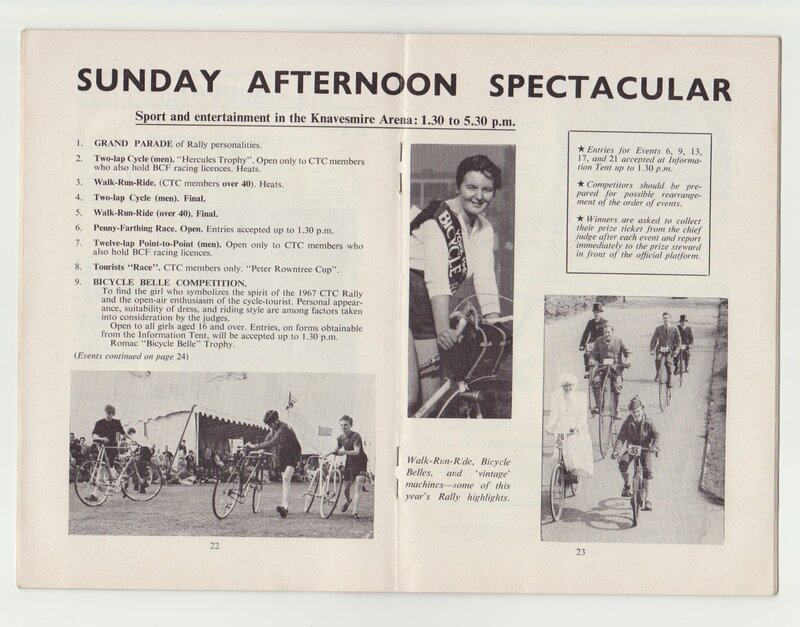 Anyway, onwards to 1963, and the show programme! 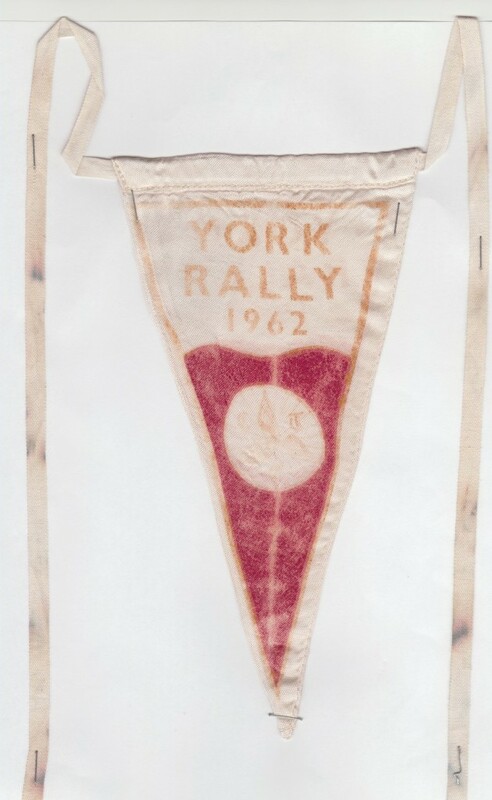 Note the sponsorship and back cover advert from the Daily Mail – an illustration perhaps of the national significance of the Rally in its heyday. The preceding pages show the event schedule, leading up to this spread all about Sunday afternoon. The picture, with a child in what looks like a nicely crafted cycle trailer, is presumably from the ‘Cycling Families’ event at 1.40pm. “Families are invited to come into the arena for inspection by the judges. Prizes are awarded for smartness of family and originality of equipment.” One to revive for 2015? a ‘Sunday Afternoon Spectacular‘ no less! 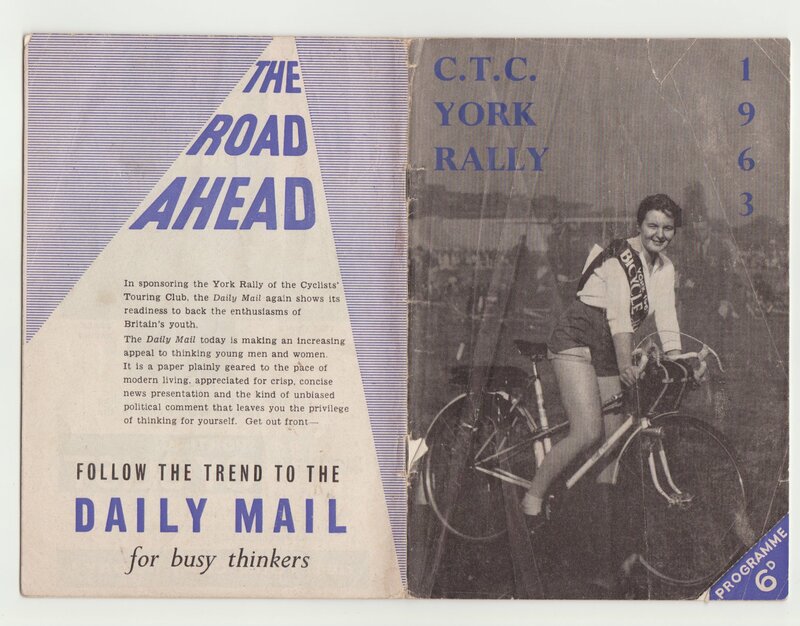 The ‘Cycling Families‘ event has been replaced, I note, with the ‘Bicycle Belle Competition – to find the girl who symbolizes the spirit of the 1967 CTC Rally and the open-air enthusiasm of the cycle-tourist. Personal appearance, suitability of dress and riding style are among factors taken into consideration by the judges.” Not really appropriate for 2015, I think most would agree. 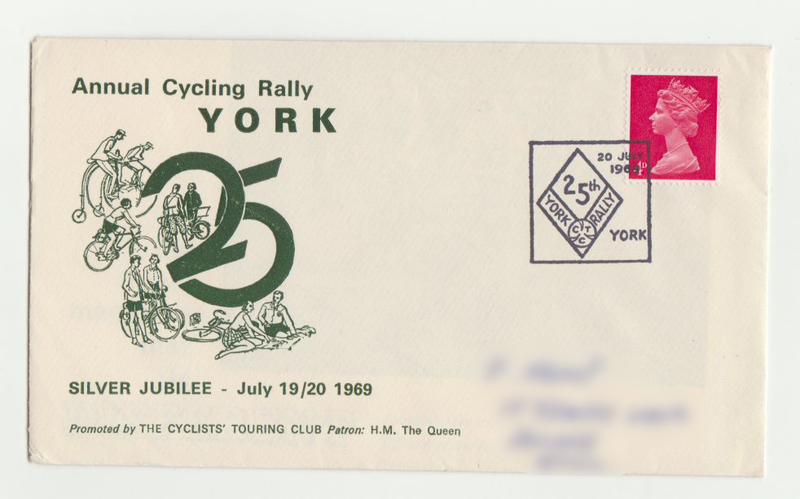 Our final item from the ’60s is this envelope dated 1969, which contains just a subscription reminder. I’ve blurred the recipient address on this web version – it’s not inconceivable that it’s still valid. 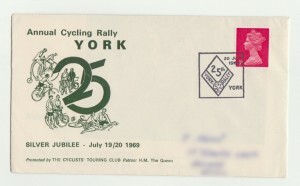 More lovely artwork – and note how even the postmark promotes the 25th ‘Silver Jubilee’ Rally! 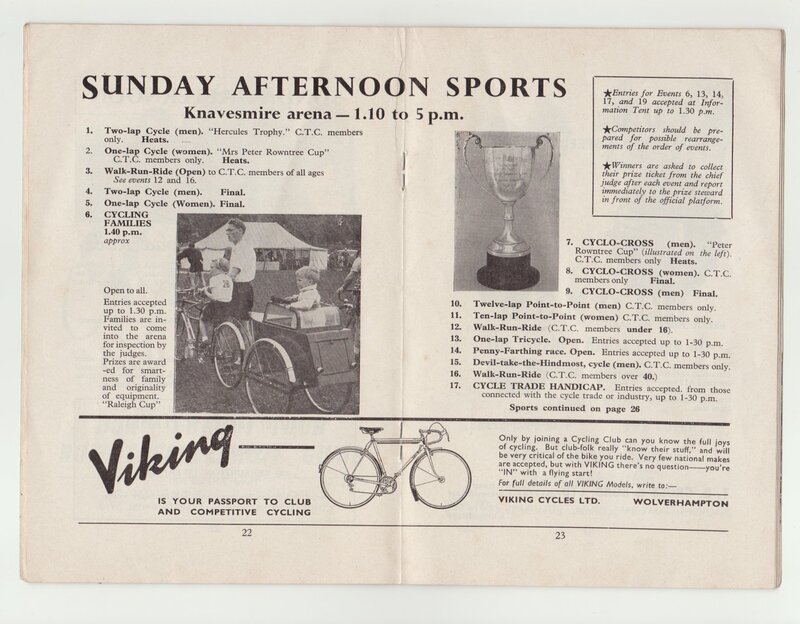 Fond memory of winning the one lap trike race in 63 or 64/65. Borrowed a trike having been the year before and seen little competition. A team from up north turned up with multi geared trikes with differentials and two wheel drive against my nearside one wheel drive wooden rimmed job. Won despite that and have the photo to prove it. Previous PostPrevious Surveying the Knavesmire perimeter track – with video!